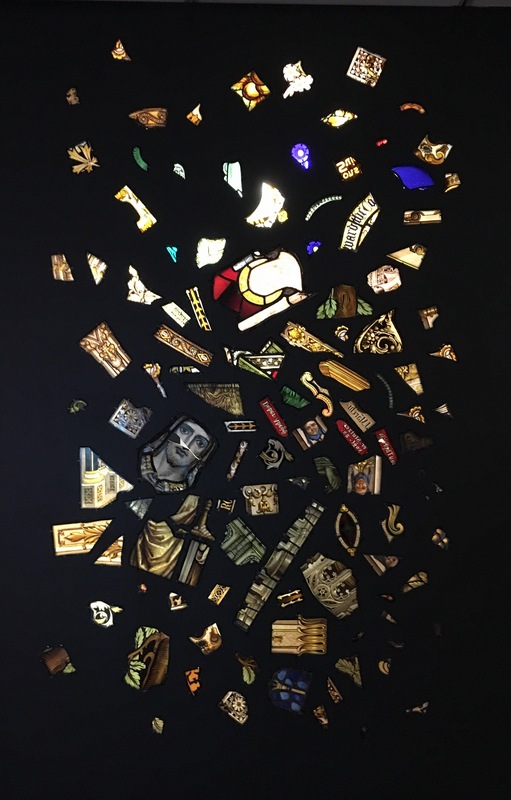 KADER ATTIA, Untitled, 2014, 116 stained glass fragments, metal screw hooks, and fluorescent fixtures. The above is installed in a temporary wall. When entering the one-man show one approaches the back (or is it the front) of the piece. There is a rough, torn out hole in the wall, pieces of plasterboard lie scattered and heaped on the floor. The structure of the wall and the lighting behind the stained glass can be viewed through the hole. This installation reminded me of a disused church in Worcester, England that had lain empty for a while. Pieces of bottle green and purple coloured glass from the windows, lay on the earth surrounding the building. It was eventually converted into expensive apartments.